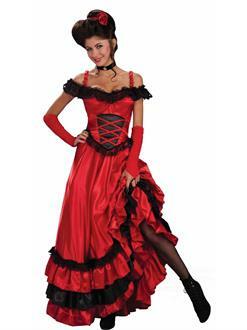 Your favorite western movie or TV show comes to life with the Women's Saloon Sweetie Costume. Take a page out of the olden Western times, where women wore ruffled dresses and served men their cold brewed beer. These women were often beautiful and a wonder to behold. This Halloween, you can also be a wonder to behold in the costume that comes with a headpiece, dress, corset belt, and glovelettes. Serve up some looks this Halloween with the Women’s Saloon Sweetie Costume!